That's a total of ten (eight if there's a DVD drive), while the system has fourteen SAS/SATA ports. You can see where we're going with this. This metal device lets you use four SAS or SATA spinning or SSD drives, and has two fans and four SAS ports in the back, in addition to a single Molex 4-pin power connector.Two of those, and you can have a total of 12 drives in the system. Not quite server grade: HP server drive trays are much, much nicer, support hot swapping with the right controller, and their activity light indicate possible fault and RAID set identification, besides, well, activity. This unit's activity lights are tiny, hard to see, and in my experience, don't always work. We've asked HP to come up with server-grade backplanes for the workstations and still hoping it might happen. How many of these units can fit in a Z820? 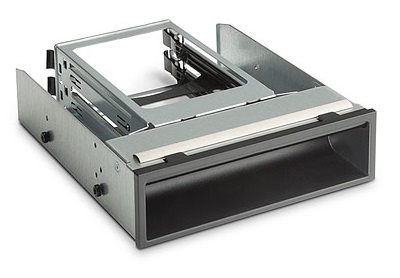 Theoretically three as there are three "optical" (5.25" half-height) bays in a Z820, two if an internal CD or DVD drive is used. They're a rather tight fit against the CPU fan housing so choose your SATA cables wisely: those with long necks may not work well. Was this helpful? Leave a comment.